Civilization came to the west bank of the Missouri with the establishment of Fort Atkinson in 1820 about a half mile southeast of here. Named after its founder, General Henry Atkinson, this western-most Fort protected the frontier's developing commerce. Established as a temporary camp in 1819, Fort Atkinson was the largest and strongest outpost above St. Louis. The permanent post went up a year later on the site of Lewis and Clark's Council with the Oto and Missouri Indians. From Fort Atkinson troops under the command of Col. Henry Leavenworth moved up the Missouri River in 1823 to punish the Arikara Indians after an attack on William H. Ashley's fur trading party. Members of the garrison ascended the river in 1825 on a mission of peace, participating in a series of treaties with the Indians. This spearhead of white civilization was abandoned in 1827. But in seven years Fort Atkinson had brought the first school, the first white family life, a library, a sawmill, a brickyard, a grist mill, and large-scale agriculture of the west bank of the Missouri. 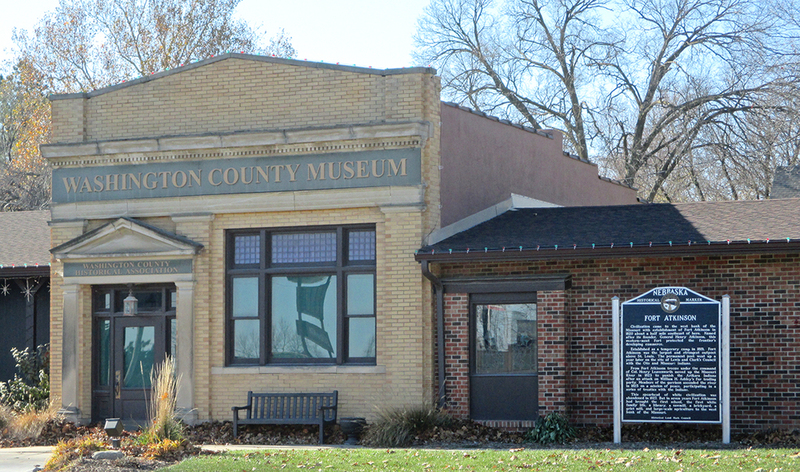 “Fort Atkinson,” Explore Nebraska History, accessed April 19, 2019, https://mynehistory.com/items/show/511.